The intersection of retail and technology is where Hector Medina has found his niche. As vice president of information technology at Macy’s, Medina not only supports the company’s ongoing digital needs, but also leads the way for innovations that can help the business grow. Medina joined Macy’s two years ago from Luxottica, the eyewear company that owns LensCrafters, Sunglass Hut, Pearle Vision, and others. As global senior director of IT, his role took him to Europe, Latin America, and South Africa. Before that, Medina spent eighteen years at Procter & Gamble (P&G), first in Mexico and then Puerto Rico, before coming to the United States in 1999. When he started at P&G, his focus was on logistics. Already, the puzzle pieces of using technology to optimize the supply chain and reduce cost were coming together for Medina. With an MBA in marketing and a master’s degree in information technology, Medina had found a way to combine his two passions. Now, using technology to optimize store productivity at Macy’s is one of Medina’s major goals. He has led his IT, strategic planning, and analytics teams to work with the University of Cincinnati Research Institute to create modeling to ensure store space is used in the most productive possible way. Determining where merchandise is placed in the stores is one of the most crucial and expensive decisions made in retail, Medina says. With hundreds of stores spread across the United States, Guam, and Puerto Rico, streamlining and utilizing efficient business practices are key to reducing costs. That goal has led Medina’s team to explore exciting new technologies for store visits, enabling cost efficiencies and quick turnarounds in decision-making. Needless to say, technology has changed the way consumers shop and make purchases—from apps to virtual coupons to online shopping. Macy’s is working on an in-store shopping assistant powered by artificial intelligence, Medina says. It’s a cognitive mobile web tool that will help shoppers get information as they navigate ten of the retail company’s stores around the United States during the pilot stage. Customers are able to input questions in natural language to inquire where specific products, departments, and brands are located, or what services and facilities can be found in a particular store. In return, they receive customized, relevant responses. “The usefulness of the app is very important because we want the customer to have a unique experience in our stores,” Medina says. Outside of his work responsibilities, Medina is passionate about giving back to his community. 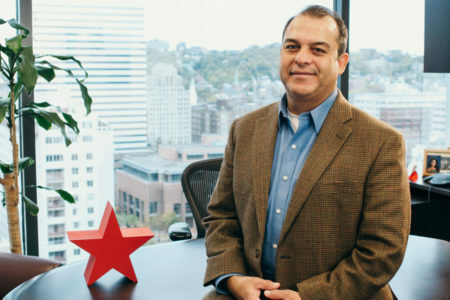 He works with students at the University of Cincinnati as a member of the school’s IT advisory board, helping to prepare students for the future needs of the industry. He is also a board member for the League of United Latin American Citizens in Cincinnati. In 2016 and 2017, the Hispanic IT Executive Council (HITEC) named Medina among the top 100 most influential and notable Hispanic professionals in the information technology industry. “It was an honor,” he says. Through HITEC, Medina mentors students involved with the National Society of Hispanic MBAs—a group he cofounded in Cincinnati—the Society for Hispanic Professional Engineers, and the Cincinnati Youth Collaborative. “When I came here, I had some mentors, but there were very few Hispanic people in leadership roles. Leaders are important because they show us how far it is possible to go,” Medina says. For Medina, inspiring a new generation of Hispanic leaders means helping them understand how to get financial aid for education, communicating with their parents, and sometimes just making sure they know the range of opportunities that are is available to them. “It’s really critical to make sure students understand that they can finish school and make it in corporate America—that the opportunities are here for them,” he says.